A series of shipments of notes ordered by Liberia’s central bank from printers overseas have disappeared since last year after passing through the country’s main ports, Liberia’s information minister Eugene Nagbe told local radio on Tuesday. The missing amount is the equivalent of nearly 5 percent of the West African country’s gross domestic product (GDP). This Yahoo story has more details. Front Page Africa has specific shipment details. The Liberian economy is dominated by both the Liberian (L$) and American dollars ($). In the recent past Liberian legislators have tried to make the L$ the sole legal tender for local transactions in an effort to turn the economy into a “single currency regime.” The fact that there are millions of US dollars worth of L$ floating around will not inspire confidence in the Liberian dollar. The Liberian dollar is not doing well in the currency markets. Zuma was elected president of the ANC in December 2007 in a bitter and bruising battle against Mbeki, the man who had sacked him just a few years earlier. The following year, the ANC recalled Mbeki, triggering his resignation as president of the country. Zuma bested his opponent in 2007 by gathering a coalition of the wounded. At the time, there were various factions within the ANC that felt aggrieved by Mbeki’s leadership style and by his economic conservatism. Many on the left within the party believed that in their haste to appease the markets and encourage international investment, the ANC’s leaders had conceded too much terrain to big business in the years following apartheid. Zuma was known as an affable but flawed man. Union leaders and young radicals opposed to Mbeki — men such as Julius Malema, who was then the head of the ANC’s Youth League, and Zwelinzima Vavi, who headed the Congress of South African Trade Unions at the time — saw the man they were installing as malleable. They hoped Zuma would promote pro-labor and pro-poor policies, so they struck a Faustian bargain. Despite his obvious personal shortcomings, and the significant political liabilities he carried, they agreed to put him in power if he allowed them to run economic policy. Being an economic conservative, albeit without Mbeki’s professorial demeanor, I am curious to see how President Cyril Ramaphosa will navigate popular demands for a renegotiation of the post-apartheid settlement which he helped midwife. Also, as corruption in South Africa did not begin with Zuma (or the end of apartheid), it will likely not end with his departure. Perhaps the biggest challenge ahead for the ANC will be to temper expectations. If Ramaphosa is seen to be too close to South Africa’s economic elite, it might elicit a populist backlash with dire economic and social consequences for South Africans. Here’s is Zuma’s resignation letter. The bigger lesson here is that the presence of wealth in a context of weak organizations (including firms, social organizations/networks, states, etc) is likely to result in the emergence of sub-optimal forms of property rights protection (which, of course, is one of the core claims of the resource curse literature). Gambeta’s book on the mafia is a classic. From what I remember Gambetta has some great sociological and economic analyses of the mafia’s private protection racket. In a move to curb the black money menace, PM Narendra Modi declared that from midnight currency notes of Rs 1000 (Kshs. 1500) and Rs 500 (Kshs. 750) denomination will not be legal tender. People can deposit notes of Rs 1000 and Rs 500 in their banks from November 10 till December 30, 2016. …. However, he said that all notes in lower denomination of Rs 100, Rs 50, Rs 20, Rs 10, Rs 5, Rs 2 and Re 1 and all coins will continue to be valid. This is an interesting move that will likely improve the Indian government’s ability to monitor cash movements in the economy. A while back Kenya’s central bank introduced rules requiring paperwork for any cash transaction above US $10,000. India’s move goes well beyond this. This is a big deal as these notes account for at least 80% of all cash in circulation! Ken Rogoff has argued for eliminating cash but this doesn’t seem to be a move in that direction since the notes will be replaced with new Rs 500 and Rs 2000 notes. Rather it seems to be a wealth tax on the black market. Old notes can be turned into a bank for replacement so ordinary people won’t lose money. People in the black market, however, probably have a lot of cash that they are unwilling to turn into a bank because they don’t want to reveal their wealth. Imagine walking into a bank and depositing a million dollars in cash–that is going to create a record that the tax authorities can follow. The wealth tax on the black market interpretation is consistent with the surprise–if people knew that this was coming they could have laundered the money but that is going to be more difficult and costly now. It’s impressive that a government could pull off this level of secrecy. Good for Modi’s image as competent, uncorrupt and technocratic. Indians are calling it a “surgical strike on black money” which is the imagery Modi wants. But what will happen tomorrow when people don’t have enough cash to buy goods and services? Would the Kenyan government be able to successfully pull off a surprise policy move like this? Certainly the country would probably benefit given all the bags of cash floating around. Over the last couple of weeks opposition parties in Kenya have staged public protests across the country demanding for personnel changes at the Independent Electoral and Boundaries Commission (IEBC) — Kenya’s electoral management body (EMB). This week’s Monday demonstrations turned violent in some towns and cities, with at least four people reported dead at the hands of anti-riot police. A plurality of Kenyans have lost faith in the IEBC (see here). In the run up to the 2013 election, several members of the commission (then known as IIEC) and its secretariat were implicated in graft (known as the chickengate scandal) involving a number of British companies. These individuals’ accomplices were found guilty by UK courts; and court documents explicitly mentioned the Kenyans that were bribed by their UK counterparts. Yet a number of those adversely mentioned in the UK court documents continue to remain in office — including the chairman of the commission, Issack Hassan. It is partially for this reason that a plurality of Kenyans (including politicians on both sides of the political divide) have lost faith in the IEBC. Opposition politicians, including those in CORD and KANU, want the IEBC reconstituted over suspicions that its current leadership favors incumbent Uhuru Kenyatta and the governing Jubilee Alliance. CORD (in my view, erroneously) maintains that the IEBC was used to rig the 2013 election in favor of President Kenyatta. KANU has most recently accused the same EMB of rigging the Kericho senatorial by-election in favor of the Jubilee candidate. CORD has also argued that its failure to meet the threshold for a popular referendum (dubbed Okoa Kenya) — whose main thrust was a change in Kenya’s electoral laws — was a result of bias within the IEBC. CORD wants the IEBC reconstituted and the new commission to have proportional representation of parliamentary political parties. Although the constitution lays out the procedure for removing commissioners of an independent entity like IEBC (through Parliament), CORD is wary of this option due to its minority status in the legislature. Initially it pinned its hopes on a popular referendum. But when that failed it resorted to mass action in a bid to strategically influence any eventual institutional reform of the IEBC (in my view this eventuality can partially be blamed on the singular failure of the(Jubilee) leadership of the National Assembly). The Uhuru Kenyatta Administration is caught between a rock and a hard place. On the one hand, it is hard for the administration to defend an obviously tainted EMB. This would also go against its continued claim that the IEBC is an independent body. But at the same time, the administration needs a reform path that will not embolden the opposition. The thinking within the Jubilee Alliance appears to be that if they give in to CORD on IEBC, what will CORD demand next? The contention that any and all reforms touching on the IEBC should follow constitutionally stipulated channels is partly motivated by this fear. In this regard, if CORD is genuine about surgical reforms specifically targeting the IEBC, it’s leadership should perhaps think of a way to credibly signal to the Kenyatta Administration that their reform agenda is limited in scope. From a purely political standpoint, President Kenyatta has reason to be cautious about the potential to open a whole pandoras box of constitutional reforms. Police brutality is (still) common in Kenya. One of the goals of Kenya’s new political dispensation following the adoption of a new constitution in 2010 was police reform (majority of the 1,300 killed in the post-election violence of 2007-8 were shot by police). The institution even changed its name from Police Force to Police Service; and an independent police oversight authority was created (to democratize the institution through civilian oversight). But experience since 2013 has shown that these attempts at reform have not yielded any tangible results. The Police Service is still as corrupt as ever. And has little consideration for constitutional limits to its use of force (see image). Which means that more Kenyans will be killed in the hands of the police if the Monday protests continue. The 2017 presidential contest will likely be more competitive than most people think. Six months ago I would have predicted a landslide reelection victory for President Uhuru Kenyatta in 2017. Not anymore. President Kenyatta is still the favorite to win (because of incumbency advantage). But the jostling over control of the IEBC and the Supreme Court are telltale signs that the political class is expecting a close contest that will likely be disputed. It says a lot that despite being the incumbent, President Kenyatta’s poll numbers have stubbornly stuck in the low 40s (he can thank mind-blowing corruption and general Public Sector incompetence for that). This means that unless we see a drastic shift in regional alliances, next year’s election will most likely go to a runoff contest between Kenyatta and Odinga — which will be close. The more reason to have credible institutions in the form of a trusted IEBC and a Supreme Court beyond reproach. What does this say about overall political stability in Kenya? At this point in time I am a lot more worried about county-level electoral violence than a 2007-08 style national disaster. That said, there is reason to fear that continued police brutality, especially targeting opposition supporters, may trigger wider civilian violence against presumed Jubilee supporters. It is a little too early to talk specifics about next year’s presidential election. But what is clear is that Kenyatta’s reelection battle will no longer be a walk in the park. Obama’s relationship with Kenyatta is complicated. A careful reading of Obama’s memoir, Dreams From My Father, suggests that he holds Kenyatta’s father, Jomo Kenyatta, the liberator of Kenya, indirectly responsible for his own father’s premature demise. (The elder Kenyatta, a member of the Kikuyu tribe, froze out Obama’s father, a Luo, from government service after the elder Obama complained too insistently about corruption.) And the younger Kenyatta’s association with human-rights violators has placed a question mark over his head. But Obama also believes that Kenyatta is at least intermittently committed to battling tribalism and corruption, and aides tell me that Obama will devote a part of his post-presidential years to the issue of African governance. Instead of focusing on “African Governance,” I’d suggest President Obama spends part of his post-presidential years as Africa’s economic ambassador to the United States and beyond. “Good governance” and “good institutions” are great. But the notion that African states have to reach zero corruption and zero rigged elections before any factories can be built is a misguided fantasy. Institutions and positive economic performance co-evolve. Good politics is not always good economics; and good economics is not always good politics. Africa, despite everyone’s apparent belief in the region’s exceptionalism, is not unique in this regard. In 2014 a respected former central-bank governor lost his job after claiming that $20 billion had been stolen. But this captures only a small share of the damage done by corruption. The much bigger question is where Nigeria could be if its politicians and officials were a little more honest. One answer comes from economists at PricewaterhouseCoopers (PwC). They compared Nigeria to three other resource-producing countries that are somewhat less corrupt than it, though by no means squeaky clean: Ghana, Malaysia and Colombia. PwC concluded that Nigeria’s’s economy, which was worth $513 billion in 2014, might have been 22% bigger if its level of corruption was closer to Ghana’s, a nearby west African country. By 2030, the size of Africa’s biggest economy should triple in real terms come what may. Yet if Nigeria manages to reduce corruption to levels comparable to Malaysia (itself hardly above suspicion: its prime minister recently had to explain how almost $700 million had made it into his bank account), its economy could be some 37% bigger still. The additional gain would be worth some $534 billion (adjusted for inflation), or about as much as the economy is currently worth. If it does nothing to change then the cost of corruption in Nigeria would amount to almost $2,000 per person a year by 2030, PwC reckons. The full PwC report is available here. Also, a gentle reminder that not all government money gets stolen through corruption (most estimates I have seen from leading African economies cap the figure at around 30% of budgets being lost). That means that there is still upwards of 70% of government budgets that never get spent well, or in some cases, never get spent at all. Improving state agencies’ capacity to absorb budgetary allocations and to effectively carry out their duties is therefore just as important as fighting corruption. Btw, Nigeria only collects about 8% of its GDP in taxes. Which is absolutely nuts. This approach to fighting corruption goes against the lessons in Peter Ekeh’s delineation between “primordial” and “civic” publics in Nigeria. According to Ekeh one’s uncle may be corrupt in the civic public, but as long as he provides benefits and adequately “shares” in the primordial public he can remain in good standing within his community. 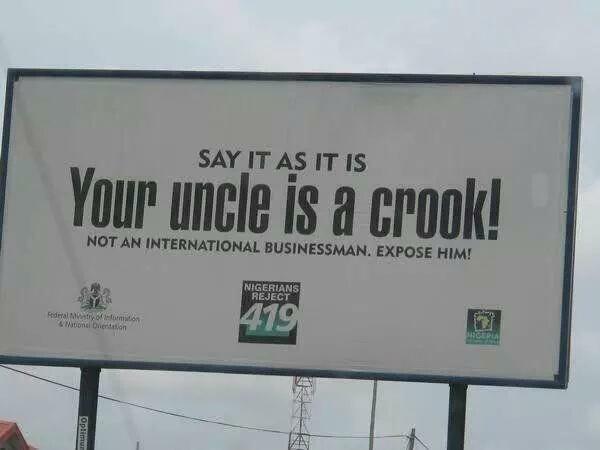 That said, the strategy might work if every Nigerian credibly promises to expose their uncle who’s corrupt but pretends to be an international businessman. The Nigerian government could nudge Nigerians in the right direction by actually prosecuting and jailing the country’s corrupt uncles and aunts. Ethiopia and Nigeria both borrowed roughly the same amounts of money from China’s EXIM Bank for massive infrastructure investments. The former sought to transform its capital’s transit system with a light rail ($475m); the latter tried to boost security in its capital by installing security (CCTV) cameras ($470m). The outcomes of the two projects are an indication of what will be the impact of China’s ongoing infrastructure projects in much of SSA. Some countries because of the specificities in their domestic political economy are using borrowed money to deliver on actual tangibles — dams, power lines, stadia, housing projects, railway lines, roads, et cetera (corruption plays a role, but projects get completed). Yet others are accruing loans (albeit on concessionary terms) simply to treat the cash injections in the same manner that political elites have treated windfalls from mineral resources in decades past. Nigeria’s Millennium Development Goals (MDG) office spent N154.2 million to construct a single borehole in Abuja, in a shocking example of contract inflation that has helped undermine the country’s ability to achieve its MDG goals. Drilling a single borehole drilling in Abuja averages N1.5 million. A hydrology firm told PREMIUM TIMES that the amount should cover drilling and casing, installation of a solar-powered submersible pump, steel tower for the tanks, tanks, pipes, joints & suckers, installation and labour. The firm allowed an expanded estimate of N10 million if a water treatment facility is included alongside other optional accessories. The Abuja borehole, constructed at Gwarinpa, an expansive estate in the federal capital, had no such fittings. Indeed, the borehole had long become dysfunctional and was no longer dispensing water to the residents when PREMIUM TIMES visited in June 2015. Still, the Abuja MDG office told this newspaper it was more concerned with service delivery to the people, than the amount it takes to do so (emphasis added).